Thanks to Karen Mayne for keeping these minutes. The meeting was led by Council member Terry Whibley. Council members Andy Protogyrou, Barclay Winn, and Mayor Paul Fraim were also present. Naval Station Norfolk/Light Rail Extension Study Update — Hampton Roads Transit provided information on the study of extension of the light rail to the Norfolk Naval Base. Based on a series of public meetings, HRT is conducting further analysis of two potential corridors. One corridor would go between the western end of the current Tide, from the area of the Mid-Town Tunnel north to the base along the general area of Hampton Boulevard. The second potential corridor would go from the Newtown Road end of the Tide through the Janaf, airport, and Wards Corner areas to the base. HRT will continue with civic meetings and will brief senior City of Norfolk staff in January. West Little Creek Road/Parking on the Grass — Leonard Newcomb, Zoning Director for the City, reported that he and Police Officer Odell Davis recently walked the six block area to observe the parking situation. He said this has been a long term problem resulting from too many cars on the small properties. The City will continue to use enforcement as one approach, but will also look at working with property owners to determine if there are options for larger driveways. K&K Square – Anna Bowerman, the new manager of the Towne Bank branch, gave a presentation about their bank, which should open in May/June 2014. It will have a drive through and an ATM machine. 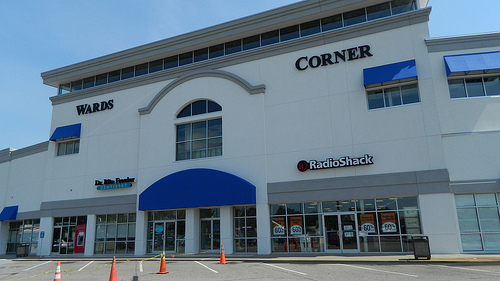 Harris Teeter is scheduled to open in February. Space for a restaurant is still vacant. A traffic light at the intersection of Louisiana and Granby Street will be in place by the time Harris Teeter is opened. Another light on Little Creek is still under study as the City has a right-of-way issue. It was asked whether the light would include an audio-visual crosswalk signal as was previously in place. BP Gas Station Update – Nothing new to report. The property is currently under contract and the developer is seeking an end user (not a gas station or 7-11 store) for a 4000 square foot retail center. Midtown Shopping Center – Firehouse Subs has signed a lease. Other eateries have expressed an interest in this area. A suggestion was made about the possibility of a food truck rodeo in the parking lot as a way of attracting attention, since the other food truck rodeos around the City have been so successful. Mike Cutter said he would present this suggestion to Mrs. Dalis. Denby Park Demolition — Demolition of 308, 317, 319, 321 and 325 East Little Creek Road; and 328, 334 and 338 Fort Worth is underway. Public Art Update – Three artists have been selected as finalists, out of 75 who submitted proposals. The selection committee will conduct interviews via Skype with the three finalists and make a selection. The location for the art installation has not been finalized but will likely be either in the median along Granby Street or possibly a small City-owned area at K&K Square. Tabernacle Church is continuing its support of Suburban Park Elementary School. The church is conducting a winter coat drive in December. They are also planning a teacher appreciation banquet. A mentorship initiative is underway to help children with math, science and reading skills, which the church would like to see everyone in the neighborhood support. The Suburban Acres Civic League and Coastal Convenience Stores (Tinee Giant) donated $635 in cash and canned goods to Suburban Park Elementary in November in support of the school’s Thanksgiving baskets for needy families. The issue of replacing the hanging traffic lights at East Little Creek Road in front of the Taco Bell with mast arm poles was again discussed. The City reported a new mast arm pole would cost between $250,000 and $300,000. It was agreed that the issue of traffic congestion and traffic control in the Wards Corner area of Little Creek would be discussed at the February 2014 task force meeting. Another concern is the utility poles that have been on the ground in the area of Tucker House at Armfield and W. Little Creek. The contractor who was undertaking that project went bankrupt and the City is working on getting the poles removed. The Wards Corner Public Art Planning Committee (WCPAPC) met once again on December 2, 2013 at the Selden Arcade. City staff (Planning Department, Parks & Rec, Public Works), representatives of the community, and representatives of the Norfolk Public Art Commission were in attendance. Four hours were spent poring over 75 artist responses to the Request For Proposal for Public Art in Wards Corner. Each of the 75 was scored on a scale of 1-10 by each of those in attendance. The top selections were then reviewed and scored again until the group came to a consensus on three final artists. The final artists are Osman Akan, Gordon Huether, and Karen Yank. The next step in the process will occur in the next two weeks when the three finalists will be interviewed via skype. The WCPAPC will then choose a finalist who will then enter into a contract with the city to visit Wards Corner, create a proposal specific to Wards Corner, and, if accepted, construct the art. When the artist visits Wards Corner they are expected to visit the taskforce and/or local civic leagues for education and input. You are currently browsing the Wards Corner Now - Wards Corner, Norfolk, Virginia blog archives for December, 2013.